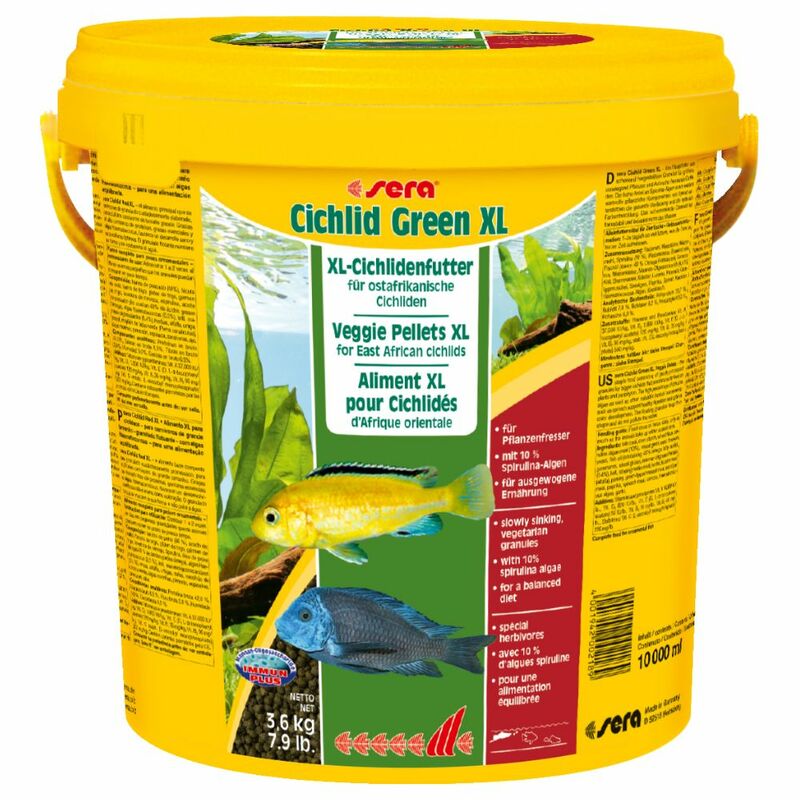 Sera Cichlid Green xL is a complete main fish food that provides all the nutritional needs of all herbivorous cichlids and other big fish that mainly eat plants and periphyton. For healthy fish with vibrant colouring, the pellets are enriched with 10% spirulina algae and a mixture of minerals, proteins, vitamins and fibre designed to promote growth and health. Rich in Mannan Oligosaccharides (MOS), a prebiotic component of yeast cell walls, the food also helps strengthen your fish's immune system as well as digestive and circulatory health. The combination of spirulina algae with other plant ingredients, such as spinach, make the Sera Cichlid Green xL particularly tasty and a highly accepted feed. The pellets retain their shape and won't diΒolve, meaning the aquarium stays clean and clear. This helps prevent algae growth and keeps your fish's environment healthy. The balanced composition of the pellets, with a size of 4mm, is designed after the natural food source of herbivorous cichlids and other big fish that mainly eat plants and periphyton. It keeps your fish healthy and at the same time contributes to a clean aquarium too Sera Cichlid Green xL at a glance: Main food for herbivorous cichlids and other big fish that mainly eat plants and periphyton. Nutritious mixture of ingredients: with carotenoids, minerals, vitamins, provitamins, trace elements and dietary fibres. Enriched with Mannan Oligosaccharides (MOS) and Spirulina Algae Strengthened immune system, digestive and circulatory systems Promotes growth, healthy development and vibrant colouring of your fish Pellets retain their shape in the water Made in Germany.